Your Holiness, in the last three decades you have visited the Serbian Orthodox Church in the United States of America on several occasions. You made these visits as Bishop of the God-protected Diocese of Nis, as a member of the Holy Synod of Bishops, as the administrator of the Dioceses of Midwestern America and of Western America, and you were also an active participant first in the establishment of liturgical, and then finally of administrative unity of our church here. This is your first visit to us as Serbian Patriarch. What is the goal of your visit at this time? The primary, but not the only reason for my visit to Chicago, was my wish to participate in the six-month memorial service for Metropolitan Christopher of blessed repose. Because of the inability to obtain the necessary visa in time, I was not able to attend the funeral service, and so I decided even then with the agreement of the Holy Synod of Bishops to come for the six-month memorial service. As I said, there are also other reasons. It is known that I accepted to administer the Metropolitanate of Libertyville-Chicago. My desire to familiarize myself with the current condition of the Metropolitanate, as well as to meet with my brother bishops, clergy, and faithful people from Chicago and the surrounding areas, is the second reason for my visit. Patriarch German led the Serbian Church under communism. Your predecessor, Patriarch Pavle, guided the ship of our Holy Church during the dissolution of Yugoslavia, with its tragic wars and political turmoil. How would you characterize this current time in which you are at the head of our Church, and what are the challenges of the present time? The time in which Patriarch German of blessed memory led the Church for more than 30 years and the present time of my election to the Throne of Serbian Patriarchs cannot be compared. Truth be told, the last ten years of Patriarch German’s patriarchal service were somewhat easier and more bearable. That was the time, as Njegos would say, when the “flank cinch of the saint’s horse had broken,” and when the communist “carriage had gone off road.” Those were hard times for the Church and the Serbian people. It required much wisdom, sacrifice, and skill to lead the Church through the horrible winds and storms, and bring it to port. No matter what was thought or said of Patriarch German here at that time, he was a wise man, devoted to the Church, and a great patriarch of the Serbian Church. Few are those who would be able to manage so wisely in the clutches of God-opposing communism. Two great schisms are associated with him, although he did nothing to cause them, nor was he able to prevent them. History will pronounce the most positive judgment about him and his leadership of the church at that dark time. Patriarch Pavle became patriarch in a no less tragic time for the Serbian people and Church. That was the time of the dissolution of Yugoslavia and of Serbia, that we all know too well. Patriarch Pavle was a holy man. He worked and shone through his holy example and his holy life. He did what was in his power in the best and most appropriate way. He considered everything that happened as something that God had allowed. His response to everything was prayer and hope in the Lord. My brief period of time piloting the ship of Christ’s Church is different in everything, but certainly not less critical and hard for the Church and Serbian people. Problems do exist, they are big, but they are different in nature. This is the time of the consequences of the previous times and conditions. Crises of all sorts are present, and each one of them is equal to the hundred-headed beast which unmercifully swallows and eats. The moral crisis is the biggest and most disastrous. It is of consolation that the Church and state with their numerous institutions are putting forth much effort to improve the current condition. We hope that the Lord will not abandon us. Your Holiness, your predecessor Patriarch Pavle of blessed repose was a great person, a “walking saint” as many of his contemporaries called him. Maybe his funeral was the biggest testimony to his great personality. How much did he contribute, through his life and work, to the good image of the head of the Serbian Orthodox Church? The funeral of Patriarch Pavle of blessed memory was a testimony to the respect he enjoyed among our people. In spite of the fact that he was absent from the Patriarchal Throne for a long time, he was not forgotten by our sister churches, nor by the representatives of Christian churches and communities. That was the most magnificent funeral ever seen in Belgrade. His funeral showed how much he was respected among the people and how much the people have turned to the Church after all. You had known Patriarch Pavle of blessed memory since your youth. While he was the Bishop of Raska and Prizren, you were a professor at the theological seminary at Prizren. What was the scope of his influence on you, your life and work? How do you see that now as his successor on the Throne of the Serbian Patriarchs? Yes, I did know Patriarch Pavle from the days of my youth, before I went to Seminary. He was at first a guest and then a brother of the Annunciation Monastery in the Ovcar-Kablar Canyon region. That was at the time when I had spent one year at the Transfiguration Monastery also at Ovcar, after finishing the third year of high school. After that year, I continued my high school education. During that year, I got to know better Mr. Gojko, as many called him at the time. Later, he was my lecturer for one year at the Prizren Seminary, at which time he was already a Deacon. Later, I was in Prizren for many years as professor and rector while he was the Bishop of Raska and Prizren. Indisputably, it was a blessing to be close to him. Every word and gesture that came from him evoked admiration and respect. In everything, he was moderate, he always followed principles, and was never ambiguous. Simply said, he was a precious gift from God to our church. The first anniversary of your election as Serbian Patriarch has recently passed. When you look back, are you satisfied? The span of one year is short and insufficient to render a more serious evaluation. It is just enough to understand the field of work and abundance of duties and problems that need to be confronted. Immediately after your election as Patriarch you were confronted with many accumulated problems in our Church, especially in the Diocese of Raska and Prizren. What is the current situation in that Diocese after the well-known events and changes that took place there? Conditions in the Diocese of Raska and Prizren have been hard and very heavy to endure for a long time now. The Serbian people in Kosovo and Metohija live on Golgotha, which is unique and inappropriate in today’s world. That Golgotha cannot be described by words, it can only be seen. That is life in a ghetto, in constant fear for one’s very life. It is a life without freedom, in extreme poverty and deprivation. Imagine a life in which your life is endangered while you are in your own house or backyard, not to mention going to your garden or in the field. In the whole Djakovica, there are only five old ladies living in the churchyard, in the church house, who have not dared to leave the churchyard for five years. The situation is the same in Prizren, Pec, Pristina, and other places. There are those who think that the resolution of problems in our Church did not need to start in the Diocese of Raska and Prizren. In that context, they think that the effects of solving that case, had they been done in sequence, could have been much easier and less painful. Is this kind of thinking justified? Unfortunately, the matter which you address was already overripe at the moment when it was resolved. Patriarch Pavle’s illness, and his two-year absence, delayed the initiation and resolution of the situation in the Diocese of Raska and Prizren. Bishop Artemije had been in a divergence from the Holy Synod of Bishops and Assembly of Bishops of the Serbian Orthodox Church. He did not respect the decisions of the Synod and Assembly. He did not report about his work or the great financial assets under his control to anyone. The fateful questions about Kosovo and Metohija he considered to be his personal problem, and his alone. In his own Diocese he created division among monastics and priests, which could not and should not have been allowed to happen. Further, he surrounded himself with bad advisors and co-workers whose advice he listened to blindly. Thus, his remaining at that Diocese was leading to its collapse, and it made the already difficult position of Kosovo and Metohija even harder. How much is the Serbian Orthodox Church doing to improve or normalize the status of Orthodox Serbs on Kosovo and Metohija? The Church has a huge role in the lives of the Serbs on Kosovo and Metohija. The Church is doing everything that is in its power. The Church is organizing several soup kitchens for hungry people, and collecting help in the form of goods and money which is distributed through Bishop Theodosius and the priests to the people. Bishop Theodosius was very active in this field while he was the Abbot of Decani Monastery. Now, as Bishop of Raska and Prizren, he is doing this with even greater diligence and responsibility. Your Holiness, in 2013, Nis, the seat of your Diocese, will host the formal celebration of the 1700th Anniversary of the proclamation of the Edict of Milan. Besides the Orthodox, this occasion is expected to draw the presence of other Christian communities, even the Pope of Rome. You would be the first Serbian Patriarch during whose time the Pope would step on Serbian soil. Are you ready for such a step? Is it time for this? The Christian world is preparing to formally celebrate a great date and great event from its history—the 17th centennial of the time when Emperor Constantine the Great declared the Edict of Milan. In the opinion of representatives of both the Eastern and Western Church, it would be the most normal that the central celebration takes place in Nis, the birthplace of Emperor Constantine. We believe that the Serbian Church and Serbian State, which are the organizers of this historical jubilee, should invite representatives of all the churches and recognized Christian communities to take part in this historic celebration. This occasion could be an occasion and opportunity to open a new era in inter-Christian relations. Instead of hostility, hate, and intolerance, may the spirit of Christ’s love take hold, something that was often missing in the past centuries and recent past. Your Holiness, the whole world is in the midst of a great economic crisis. Besides the crises and strikes, unemployment and hunger, corruption and crime are in full bloom in Serbia. The ruling structure is attempting to present things in a better light than they actually are, but the state is quickly falling in a catastrophe of debt. Should not the Church, out of love and concern for our believers, be louder and more open when it comes to the question of economic and social conditions in our state, as is the case in Greece and Russia? The current situation in Serbia is very hard, with the tendency to become even harder. Unemployment is huge. There is fear of more workers losing their jobs. The fight against crime and corruption is great, and there is no end in sight at the moment. The current situation is the consequence of everything that has happened in the last two decades. The great world powers had their involvement in those events as well. Commerce and economy have been destroyed, as has the system of moral values. It cannot be said that the current government is not making great efforts to change things for the better. Maybe they are not doing as much as needed, or in the best way. The needs are great and the possibilities are small. The people believe in and expect better days to come, but it would also be good if the people would change some of their habits and contribute to their own improvement, for the things dependent upon them. The demographic picture of Serbia is very concerning. Every year 33,000 more people die than are born. This is not something you hear a lot about in church circles and publications. The Serbian Church could be the initiator of a national renaissance in this field, don’t you think? The demographic picture is more than concerning. Every year one city of 30,000 or more souls disappears. Villages are abruptly dying out due to the departure of the youth to the cities, who later leave the cities to go abroad searching for jobs and sustenance. The lack of employment for young people is the main reason for delaying marriage and thus bearing children. Of course, there is another and maybe even more important reason, and that is the low moral consciousness and life of vice among young people. The Church is not indifferent toward these problems, but its voice does not easily reach those for whom it is intended. Other messages are far more attractive and acceptable. Your Holiness, you are one of the bishops who are well informed about the condition of the Serbian Orthodox Church in America and Canada. Will the next meeting of the Holy Assembly of Bishops finally resolve the organizational structure of our Church in these regions? I do not know what kind of resolution is implied here. All problems that exist in dioceses outside of the motherland, as well as potential problems that may appear, are considered and resolved at the Holy Assembly of Bishops as the highest church body. Of course, it is a principle to make all decisions in the spirit of canonical guidelines, in the spirit of the centuries-old tradition, and considering the overall life in the particular church region. We are, Your Holiness, very much attached to the Serbian Orthodox Church and we endeavor to maintain close ties with the motherland. As you already know, all around the world outside of the borders of the autocephalous churches, Episcopal Conferences of Orthodox Bishops have already been organized which could grow into independent units. Could that contribute to the loosening of ties between the Mother Church and us in the Diaspora? What is your view on this subject? We are hoping and doing everything so that our Church survives on this continent, and it will exist here as long as there is a national consciousness among the people that they belong to the Serbian family and culture. We need to welcome and support the organizing of conferences of Orthodox bishops in places where there are representatives of Orthodox autocephalous churches and people. There are many problems that are common, and it is natural to solve them together. We all belong to one Church, that is only administratively divided, and it is completely natural and normal to lead a dialogue about canonical and pastoral issues on a common territory. This does not call into question relations with one’s Mother Church. Your Holiness, as the Primate of the Serbian Orthodox Church you are exposed to criticism and praise. That which is certain is that you are a man of principle and that you are open for dialogue. After your election as Patriarch, at your first press conference in Belgrade, you said to the journalists: “Ask me openly, everything that you wish.” Please amplify. We live in a time when everyone thinks that he is called and has the right to render his own judgment, whether or not he is familiar with the essence of the problem. Praise comes easily, and criticism and objections come even easier. This mostly makes me feel unconcerned and at peace, while I surrender myself to the opinion and judgment of God. It is important what people think, but far more important is what the One who is above us thinks and judges of me. I would recommend this principle to others. Every story about what is happening in our homeland often attains a different character and connotation by the time it reaches America. 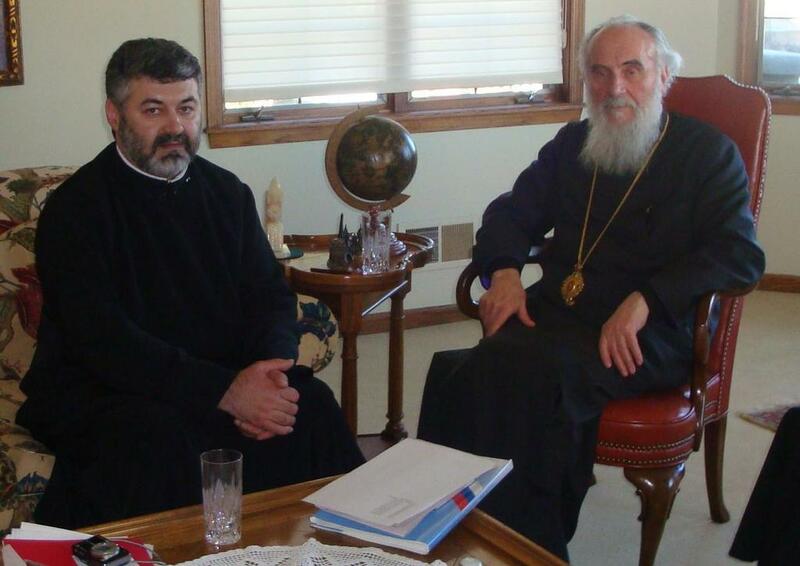 What is your message to the Serbian Orthodox people in America concerning the resolution of problems in the Church? To whom should they listen? At one time, more normal than what we have today, it was known who can and had the right to talk, and who was called to address and solve problems in the Church, state, and other institutions. The rest accepted these decisions with confidence. And from there comes my advice to our faithful Orthodox people to let the Church solve problems and make decisions with regard to faith, morals, and Church organization, and that they as a faithful and loyal people accept these decisions with full confidence and love. Your Holiness, you recently marked the first anniversary of your election to the Throne of the Serbian Patriarchs. During your inaugural sermon in the Belgrade Cathedral, you said words that have remained in my memory. You said that when you were first elected as Bishop, and later as Patriarch, your heart trembled like an alder leaf that is blown by the wind. Can you tell us something more about that feeling? Yes, I said those words during the official enthronement at the Cathedral Church in Belgrade. The calling of bishop and patriarch in Christ’s Church is a huge honor and gift from God, but it is also a huge responsibility before God and the Church. Many have rejected that honor out of the fear of the spiritual height to which they would ascend. This thought was not foreign to me either. Even then as now, I am well aware of the huge calling and fearful responsibility. The alder leaf always trembles even at the smallest breeze, just as my heart trembled, filled with fear at the awareness and realization of everything that would be expected from me on that responsible path. We are on the threshold of the Great and Honorable Lent. I congratulate the faithful people in these blessed days with prayers to the Lord to give His Divine Grace, that you may spend these holy days in joyful repentance and prayer, and that you may await the most joyful feast of the Resurrection of the Christ in this spiritual state. Your Holiness thank you for this conversation. May the Lord give you good health and long life. Many years to you, holy Vladiko!